It’s official: The Heartstriker series is one of my all-time favorite urban fantasy series. If you’re unfamiliar with the series, please do yourself a favor and start with the first book, Nice Dragons Finish Last. 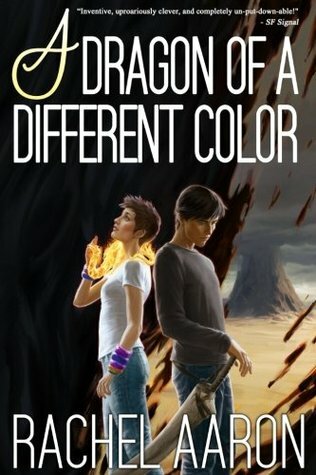 A Dragon of a Different Color is the fourth book in the series, and you’d be pretty confused if you started here. Also since book four picks up directly where book three left off (this entire series has taken place over the span of something like a month), spoilers for prior books are inevitable! So quit reading now or forever hold your peace. Let’s get this review rolling and start with the biggest topic of them all: last book, Marci died. Only, dying is a bit more complicated than usual when you’re bonded to the spirit of the Forgotten Dead. Marci’s dead, but she might not be permanently dead. To get out, she’s got to become a Merlin, and she’ll need to beat Myron to the chase. I don’t want to say too much about this whole plot line, but I love how it allows Marci to shine and how it expands the world. We actually get to see the sea of magic that’s flowing into the world and creating spirits! That’s pretty darn cool. Speaking of, how is it that Julius is so clueless about what Chelsie’s big secret was? It’s sooo obvious! Oh, well. Everything is revealed in this volume. Well, regarding Chelsie at least. I still have plenty of questions about what Bob’s up to. He’s clearly got some grand scheme, and he doesn’t seem to care if it results in his own death? I’m starting to question how much Bob actually cares about Julius versus seeing him as a tool. Somehow, I still have faith in Bob, and I think Julius does too. Let’s just hope that that faith doesn’t get betrayed any farther in book five. And I need book five! I’m very happy that it’s coming out this year, because I want to read it ASAP. This series has been so amazing that I can’t imagine what the final volume has in store. I love the titles of all the book in this series so much! Oh I actually thought this was the last one! I haven’t read it yet, guess subconsciously I might have been putting off because I didn’t want it to be over, but it’s good to know there’s one more book! The last book comes out on March 1st, and I’m going to be such a mess when I read it. I want more of this series! I’d be up for a read along of the series!